Kegon Falls, has the fame of one of the three most beautiful waterfalls in Japan. Known locally among the Japanese with the name, Kegon Taki, this landmark has been sculptured by nature and is located near the Japanese town of Nikko and falls within the Nikko National Park. This protected area is divided into the Tochigi Prefecture. Kegon waterfall is located on Lake Chūzenji, which is the main source of river water for the Oshiri River. Kegon waterfall is extremely picturesque and beautiful. The water flow there falls from 97 meters in height, and quite often the violent flow of water is accompanied by beautifully formed arcs resulting from the collision of water drops with the sun. Often the rocks of the waterfall Kegon are dyed in various shades mostly during spring, when the tourist flow there is greatest. However, Kegon Falls is a place of suicide - especially among young Japanese. Misao Fujimura is the name of a young Japanese poet and philosopher of the late 19th and early 20th century, who wrote near the waterfall Kegon a farewell poem before being cast in the waterfall, ending his life. At the time this incident became a scandal and was widely distributed throughout newspapers and journals. It is sad that the circumstances led to the popularity of waterfall Kegon and that it is one of the most popular suicide sites. The territory of Niko has 48 waterfalls, but Kegon Falls is the most impressive and most preferred to visit. Around Kegon itself are about 20 smaller waterfalls that go over the picturesque small cracks and slits of the rocks. The area of Kegon Falls was not particularly popular in 1900 when Gorobei Hoshino decided not to live up to the water Tea pool, which makes the area attractive for tourist visits. For eight years it took to build the teaspoon. 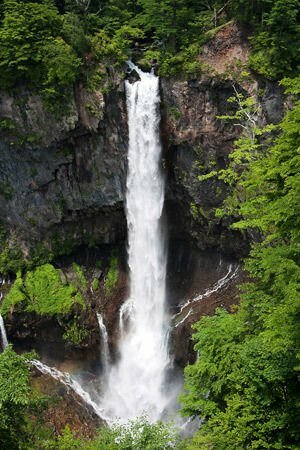 The most easy way to visit waterfall Kegon is with an organized tour from Tokyo to Nikko.